A total of 13 Virginia-bred horses won a race in the month of March including a handful who pushed their six figure bankrolls even higher and five who won their first lifetime race, one of which went on to compete in a key Derby prep race — the Toyota Blue Grass Stakes at Keeneland. Divine Interventio wins by a neck at Laurel. Photo by Jim McCue. 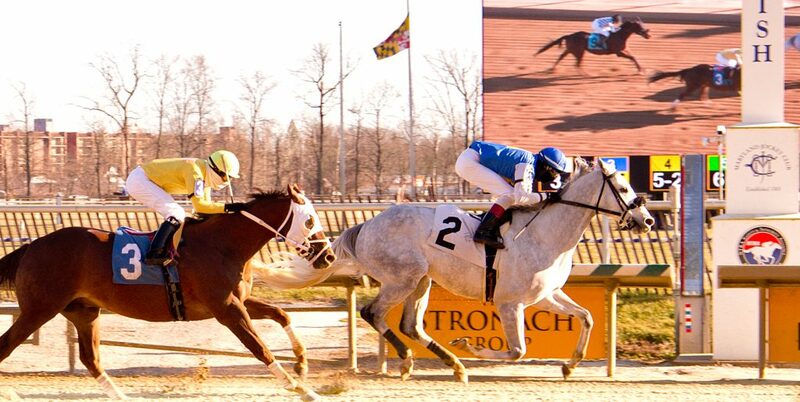 Divine Interventio won his sixth career race March 16th in grand come from behind fashion at Laurel. The 6 year old Malibu Moon gelding was last at the half by 12 1/2 lengths in a 6 1/2 furlong starter allowance. Jockey Johan Rosado led the comeback and at the wire, Divine Interventio was best by one-half length over Ten Hit. The winner collected his 19th “top three” finish in 30 starts and has a bankroll now of $294,988. The victor was bred by the William Backer Revocable Trust. Sir Rockport prevails at Laurel. Photo by Jim McCue. 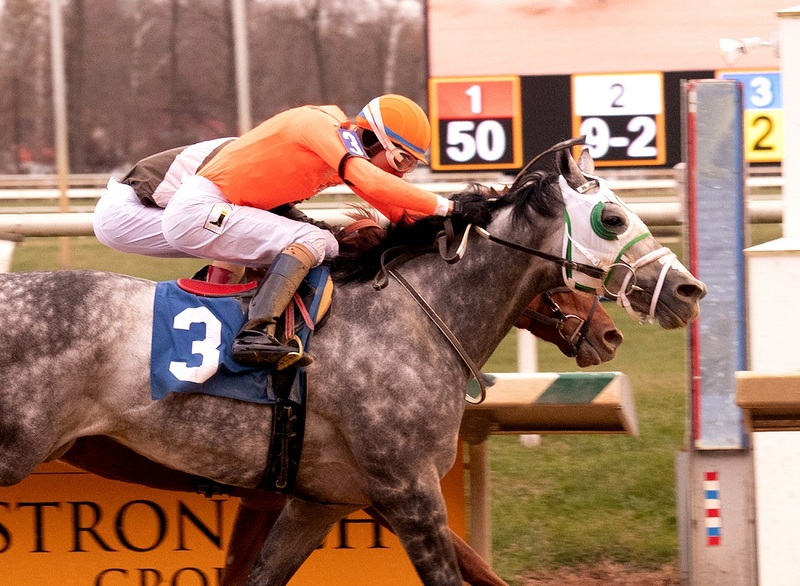 Sir Rockport continued a solid 2019 with his third win in five starts March 8th at Laurel. The 9 year old Rockport Harbor gelding also bagged second and third place finishes this year and has career earnings of $222,993 from 48 starts. He was bred by Legacy Farm & Larry Johnson. Lenstar’s $85,000 allowance win at Oaklawn the same day was his third overall from 22 starts. 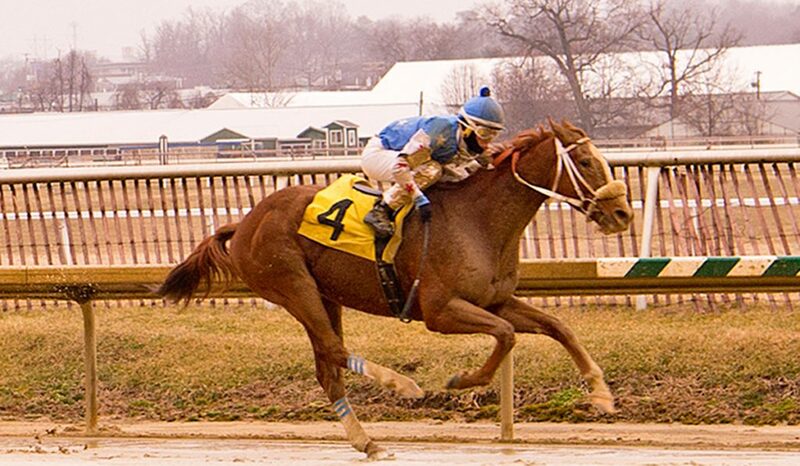 The 4 year old Shackleford gelding went gate to wire in the 1 1/16th miles test and held off Catdaddy at the wire. Bred by Lazy Lane Farms, Lenstar earned his second straight allowance win. Louden’s Gray connected at Turf Paradise March 17th and got the winner’s share of a $9,000 purse. The 8 year old Street Sense gelding won by 3 1/2 lengths and from 47 starts to date, has 20 “in the money” finishes worth $125,525 in earnings. Bucky’s Pick went farther west for his latest victory. The 5 year old Exchange Rate gelding was tops in a $33,000 claiming event March 1st at Santa Anita. The Doug O’Neill trainee has competed solely in California and has amassed $112,687 in winnings at Santa Anita and Del Mar. Chess Chief, a Dallas Stewart trainee, captured a $43,000 maiden special weight at Fair Grounds March 2nd, his first win in five starts at the time. The 3 year old was bred by Morgan’s Ford Farm and is trained by Dallas Stewart. Most recently, he finished a respectable fifth in the $1 Million Toyota Blue Grass Stakes at Keeneland April 6th. Chess Chief crossed 8 1/2 lengths behind the winner — Vekoma — after being sent off at 85-1. Another first time winner was Largent, a 3 year old Into Mischief colt who won a $50,000 maiden special weight at Gulfstream in his first lifetime start. The Todd Pletcher trainee went gate to wire and was best in a 12 horse field. He was bred by Lazy Lane Farms. Mucho Mas won her maiden special weight at Oaklawn March 30th with a purse of $90,000. The Mucho Macho Man filly also faced a large field of 12 and edged Trapped N My Hand by a head. Bred by Jim & Katie Fitzgerald, Mucho Mas has earned $79,900 from a trio of Arkansas outs. The Fitzgeralds, along with co-breeder Jim Ackerman, saw their Alphadar collect the winner’s share of a $21,000 purse in a Gulfstream maiden claimer March 24th. Wahoowah also prevailed at the same track in the same class March 29th. Bred by Audley Farm Equine, the 5 year old Bodemeister gelding was best by a neck with Julien Leparoux up top. Arkadag was bred by Mr. & Mrs. C. Oliver Iselin III. Photo by Jim McCue. Gentle Prince and Arkadag also earned wins in March. The former, bred by Three Ladies Racing Stable, prevailed in a claiming race at Golden Gate Fields while the latter, bred by Mr. & Mrs. C. Oliver Iselin III, captured a $20,000 claimer March 3rd at Laurel. And as most everyone knows, Virginia-bred Out for a Spin won an allowance optional claimer at Fair Grounds March 16th, which followed a maiden special weight triumph there on December 29th. The 3 year old Hard Spun filly, a Dallas Stewart trainee, won the Grade I Ashland Stakes at Keeneland April 6th! Read about that big upset win at www.vabred.org. The hot horse was bred by the William Backer Revocable Trust. The Virginia Gold Cup and International Gold Cup steeplechase races are a celebration of hunt country tradition and two of the largest, most celebrated outdoor social events held in Virgina. The Virginia Gold Cup is held the First Sunday of May while the International Gold Cup is held in late October, both at Great Meadow in The Plains, Virginia. You become a member of the association by purchasing a ticket to one of their races. There are no annual dues for members. The Virginia Thoroughbred Association Exists to promote the Thoroughbred horse in the state of Virgina a well as to act as both a resource and a voice for its members. The VTA strives to represent its members in the political and agribusiness spheres, provide guidance and information to members, as well as promote and administrate the lucrative Breeders Fund Bonuses through financial model that rewards the owners and breeders of Virginia-bred horses that win anywhere in the country. This is the only bonus program in the Mid-Atlantic that does not restrict payments to races in its state of origin. There is a 100 percent owner's bonus for Virginia-bred winners at any parimutuel meet in Virginia, designed to help create a market for Virginia-bred horses. Numerous Virginia-bred stakes races and restricted state-bred races are carded to give Virginia-breds the best opportunity to be financially successful for their owners and breeders. The Virginia Equine Alliance is a non-profit, 501 (c) 6 organization which is comprised of the Virginia Harness Horse Association, the Virginia Horsemen’s Benevolent & Protective Association, the Virginia Gold Cup Association, and the Virginia Thoroughbred Association. The purpose of the Virginia Equine Alliance is to sustain, promote, and expand the horse breeding and horse racing industries in the Commonwealth of Virginia. The Alliance seeks to establish and support new and multiple venues for horse racing in the Commonwealth and to advocate and support legislation, regulations, and rules beneficial to the breeders and owners and trainers of horses (“horsemen”) in the state. The Alliance represents the interests of horsemen at meetings of the Virginia General Assembly, the Virginia Department of Agriculture, the Virginia Racing Commission, racing associations, breeder’s organizations, horsemen’s organizations, and other like groups. The Alliance is committed to increasing public awareness of the economic and environmental importance to the Commonwealth of the horse breeding and horse racing industries. The Virginia Horsemen's Benevolent & Protective Association is a non-profit membership organization that represents thoroughbred owners and trainers who race in Virginia. The VHPBA negotiates with track management for race days, dates and purses, and also provides educational, recreational, health, counseling and religious programs for backstretch workers. The Virginia Harness Horse Association was established to sustain, promote and grow both the breeding and racing opportunities for standardbred horses in the Commonwealth of Virginia.